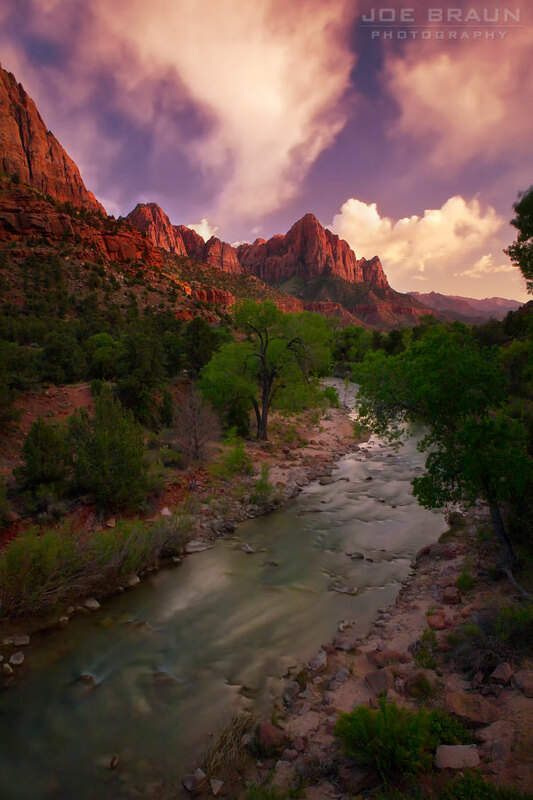 Zion National Park is a paradise for landscape photographers, with glowing orange, red, and pink textured sandstone formations interplaying with the lush vegetation provided by weeping walls and the emerald waters of the Virgin River. 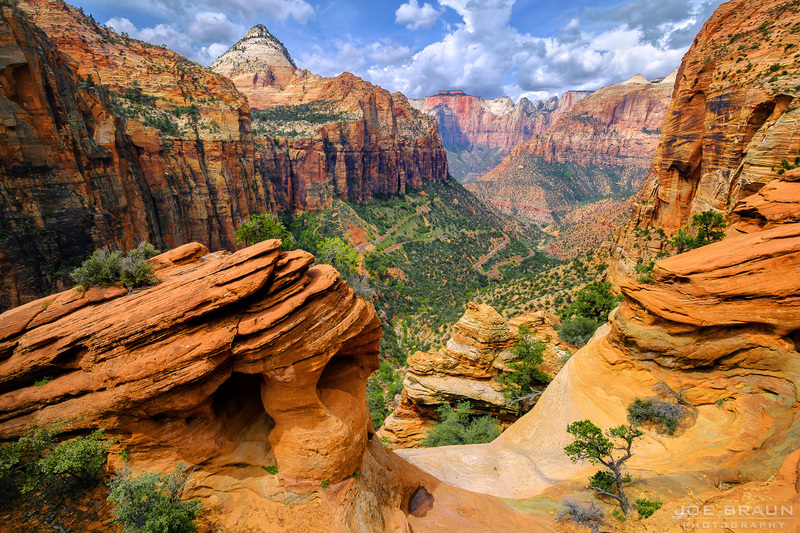 Visitors to Zion Canyon are surrounded by the majestic sandstone peaks and formations, and views from the rims above are even more stunning. Wildlife sightings are also thrilling for photography. What camera equipment should I bring to Zion? What are some good spots for photography? 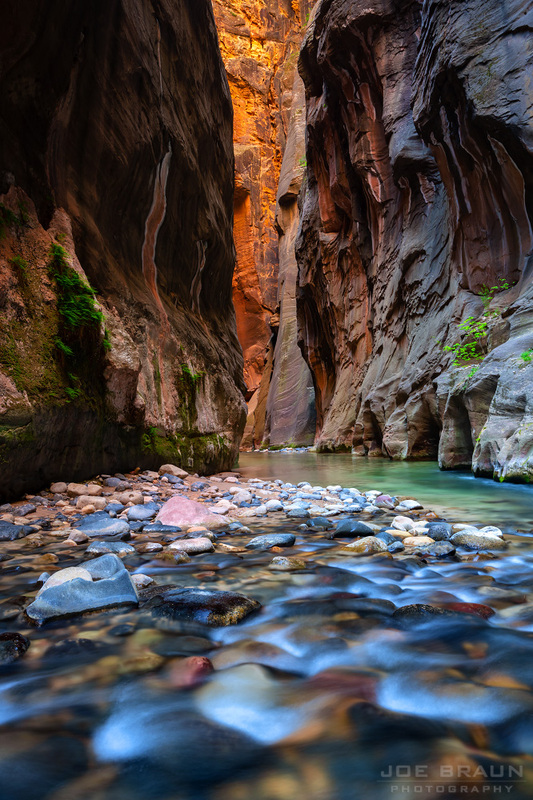 How do I protect my photography gear in the Zion Narrows? 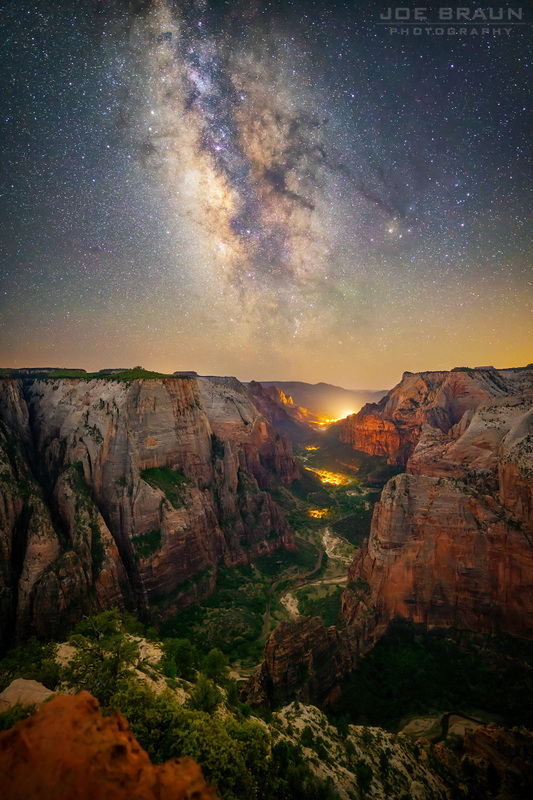 What wildlife photography opportunities are there in Zion? 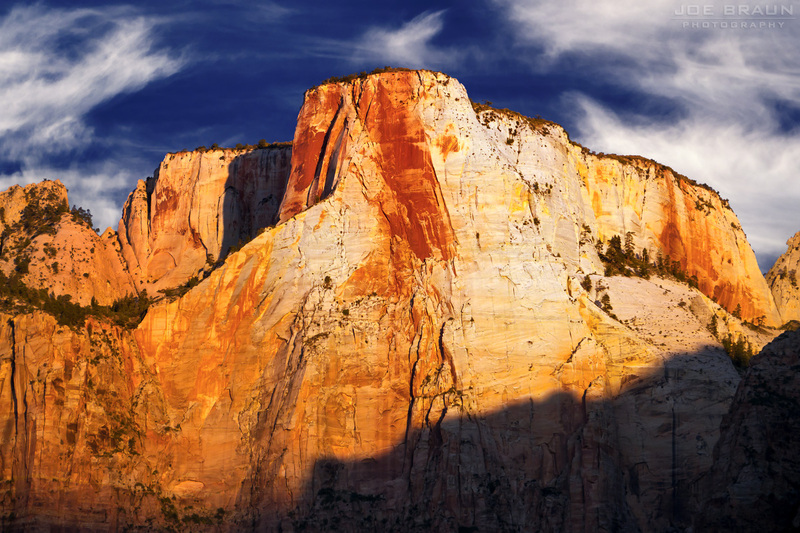 Can you share any lighting tips for photographing Zion National Park? 1. What camera equipment should I bring to Zion? I get asked this a lot, and it's probably the most difficult question to answer. While cellphones are good enough for most people these days, larger system cameras still offer much better image quality (higher resolution and better dynamic range and low-light performance) for the more serious photographer. As a hiking and backpacking photographer, I have found myself constantly battling the pursuit of better image quality with the desire to carry smaller and lighter gear on my adventures. Every piece of camera equipment is some sort of compromise between the two. I have shot with cameras made by Nikon, Canon, Fujifilm, Panasonic, Olympus, and Sony and the dirty little secret is that they are all capable of taking fabulous photographs. Whatever camera system you carry, take the time to really learn the features and controls of your equipment until it feels like an extension of your body. And if you're looking to go on long and strenuous hikes, the weight of your camera gear is a major factor, so I recommend going as light as possible. Over the years, I have encountered many miserable photographers on the trail who have lugged their entire lens collection as well as their 10-pound studio tripod around on some grueling routes. If you try to be a bit more minimal with the gear you carry, you can spend more energy getting to a unique spot and composing your photograph. 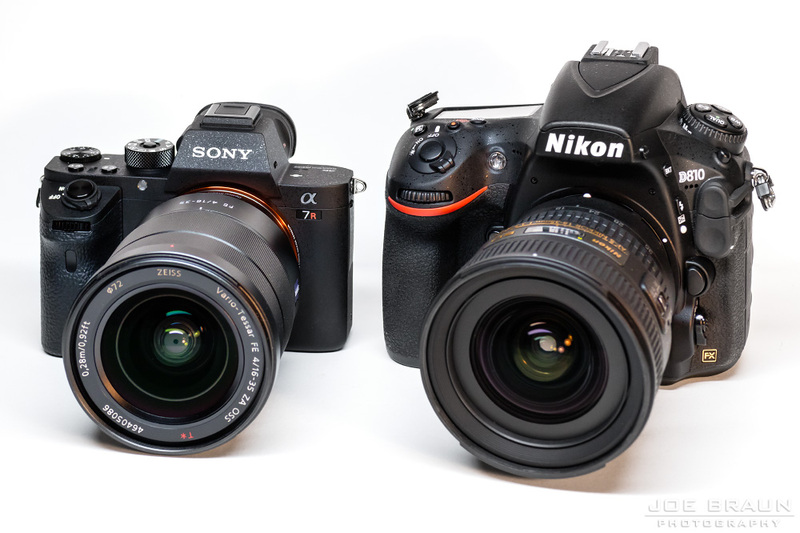 Sony A7 mirrorless and Nikon FX dSLR cameras are two of the many good camera systems out there. For landscape and hiking/backpacking photography, I tend to favor light variable aperture zooms ("consumer zooms") and f/4 zooms over expensive f/1.4 primes and f/2.8 zooms, especially since I usually shoot between f/8 and f/13 for landscape work. I typically try to carry a standard zoom lens and an ultra-wide angle lens, and if weight permits, maybe also a macro lens and/or a telephoto zoom lens for the occasional animal sighting. My current go-to landscape camera is the popular Sony A7r III and for situations where I need a really small and light camera, I shoot with the tiny Canon M6. For a more specific list of camera equipment and lenses, please see my Camera Equipment page. The iconic view of the lower Subway. For tripods, I typically bring two types to Zion: a big sturdy one for more "serious" work (like sunrise/sunset shots, time exposures, etc.) and a smaller, lighter one for use on strenuous hikes when keeping weight down is important. A big sturdy tripod can also make for a useful walking stick in the Zion Narrows. While there are many big names out there from Gitzo to Manfrotto, I'm a big fan of the relatively unknown Asian company, SIRUI. The Sirui N-1004KX Tripod is my reliable main tripod that easily supports a big heavy SLR and features a removable monopod and interchangable middle columns. The Sirui T-005KX Tripod is a good backpacking tripod when you want to go light, but it's a bit short and wobbly for long time exposures. As for lens filters, I sometimes use ND (neutral density) filters and polarizers. Polarizers can often make the sky more dramatic, bring out details in clouds, and remove unwanted reflections in water, but when overused, they can also make water look lifeless and turn the sky to an ugly dull shade of blue. Whatever camera equipment you use, take the time to learn it and bond with it, and get out there and have fun! 2. What are some good spots for photography? 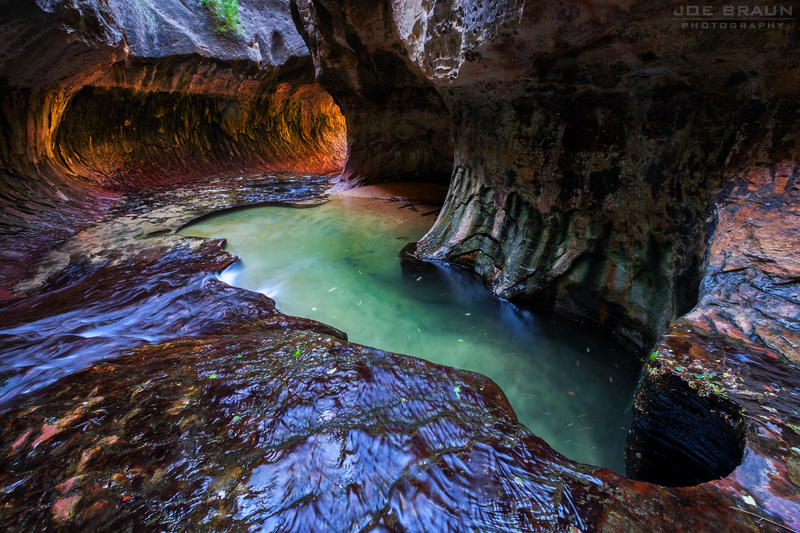 EVERYWHERE is a good spot for photography in Zion! No seriously, I mean it. 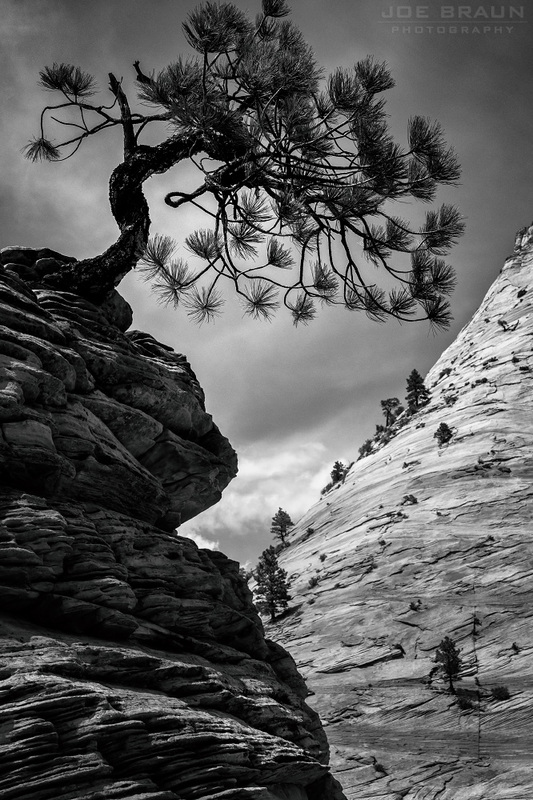 I can't think of any spot in Zion that isn't photogenic or interesting in the right light. 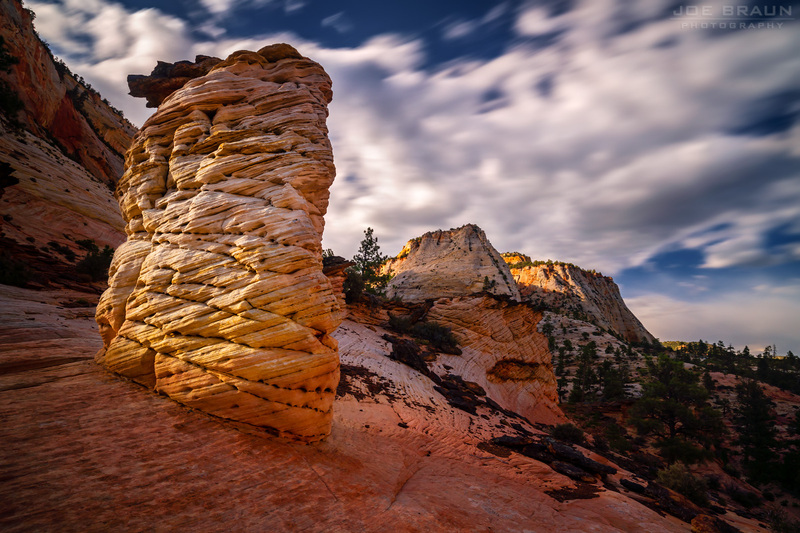 Wander around, explore, and be willing to hike a little bit, and you are sure to find photographic opportunities from majestic viewpoints to smaller-scale subjects like sandstone textures and delicate plantlife. The suggestions below are only starting points. The Towers of the Virgin from behind the Zion Human History Museum (sunrise). This is a common and convenient spot to catch sunrise; behind the museum, you can get a great view of the famous Towers of the Virgin in first light. You will typically be sharing this spot with several other photographers. Altar of Sacrifice in early morning light. The bridge over the Virgin River near the Canyon Junction shuttle stop (sunset). Another common and convenient spot that gets quite crowded with photographers in the late afternoon, the view south of the Virgin River with the Watchman in the background is an iconic view of Zion. The Canyon Overlook Trail viewpoint (sunrise). A pre-dawn drive to the Upper East Canyon and a quick hike gives you a great view down into the main canyon with first light hitting the East Temple just above. Canyon Overlook on a wonderful cloud day! 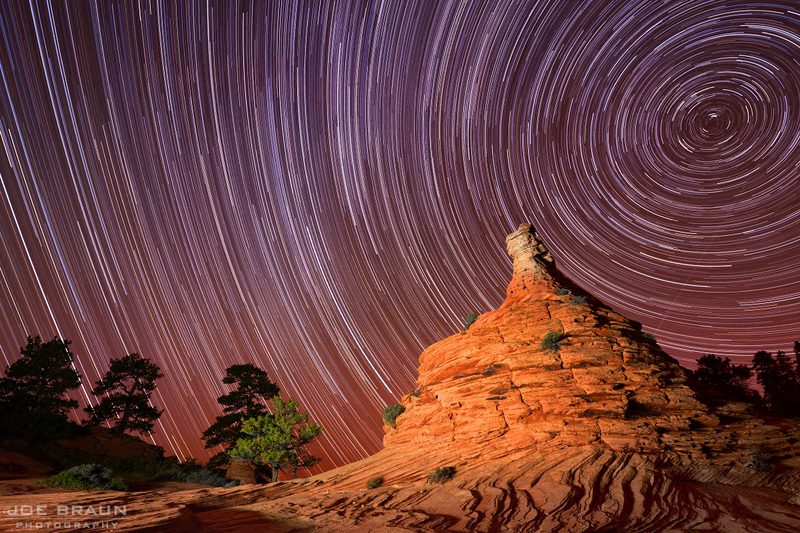 The Kolob Canyons viewpoint (sunset). 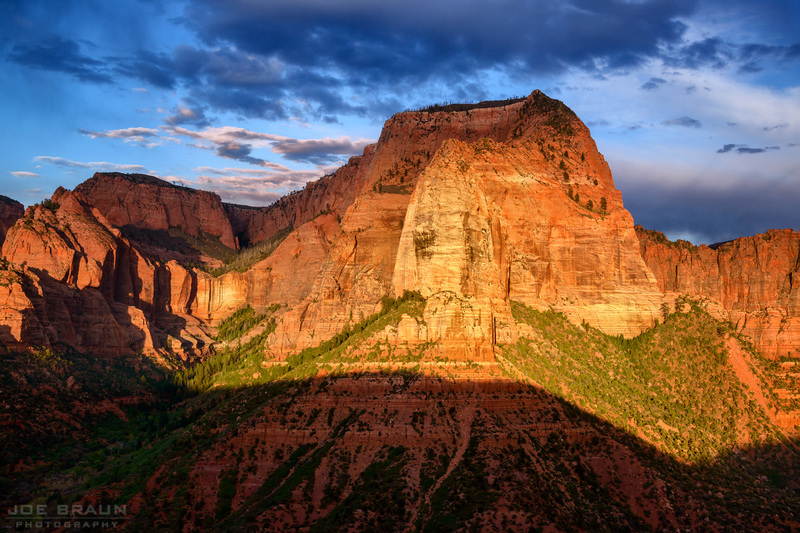 Late afternoon is a great time to drive to the end of the Kolob Canyons Road in the Kolob Canyons section of Zion National Park for a glorious panoramic view of the Kolob Finger Canyons. The view from the parking lot is one of the best in the park; no hiking is required. Sunset makes the sandstone colors glow at Shuntavi Butte. Mystical hoodoo catching the final rays of evening light. "Cliffdiver!" This is one of the more famous roadside pinyon pine/hoodoo landmarks. Kolob Terrace Road (sunset). The Kolob Terrace Road passes through some beautiful scenery as it ascends from the lower desert elevations to Lava Point (the highest point in Zion National Park). Many of the large sandstone formations (especially between the Left Fork Trailhead and the Wildcat Canyon Trailhead) are most dramatic in the late afternoon sun. Scope out the area and you are likely to find a spot that appeals to you. Be warned that there are a few private insets of land within the park boundaries, so please obey any "no trespassing" signs. "Put a Needle on the Record!"